Scones are as quintessentially British as a full English and a Royal Wedding, and it’s perhaps because of this that I’ve rendered them a bit boring (sorry Harry and Megan). This being said, I was recently queueing in one of those ‘trendy’ artisan bakeries (clean lines, planters, exposed brick and 7 nut milks- you know the drill) and I couldn’t help noticing how delicious this enormous stack of golden-topped scones looked. 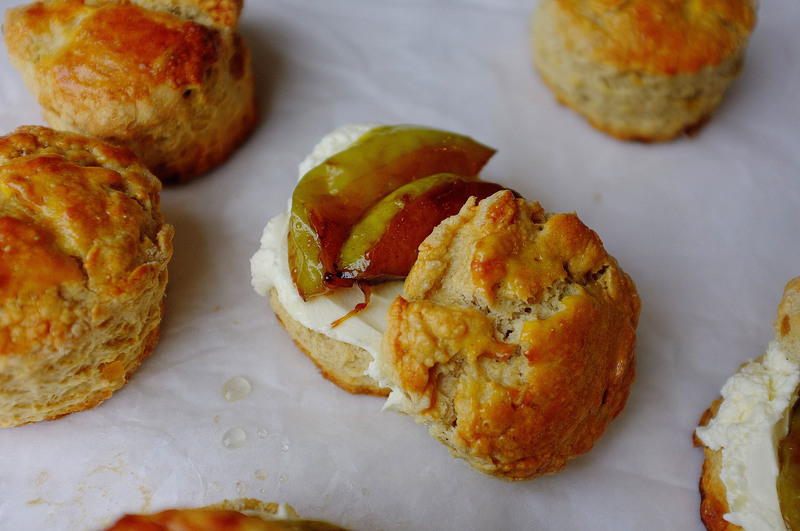 Anyway, I didn’t buy one, I went away and made these- a classic scone studded with stem ginger and served with caramelised Bramley apples, as a nod to the season, and Calvados mascarpone. So delicious and definitely not boring. Preheat the oven to 200c. For the scones, place the flour, salt, baking powder and ground ginger in a bowl and briefly mix to combine. Add the cubed butter and rub in with your fingertips, using as light a touch as possible, until the mix resembles breadcrumbs. At this stage, stir in the sugar and diced stem ginger. Add the milk and stir quickly with a cutlery knife (as if you were making pastry) until the mix comes together to form a soft dough. Dust your work surface with flour and pat the dough into a round, about 3.5-4cm thick. Cut circles out using a 5cm wide cookie cutter and line onto a lightly greased tray (try not to twist the cutter as this can affect the overall finish of your baked scones). Beat the egg with a fork and brush the tops, making sure it doesn’t run down the sides as this can prevent an even rise. Bake for 10-15 minutes or until golden and well risen. 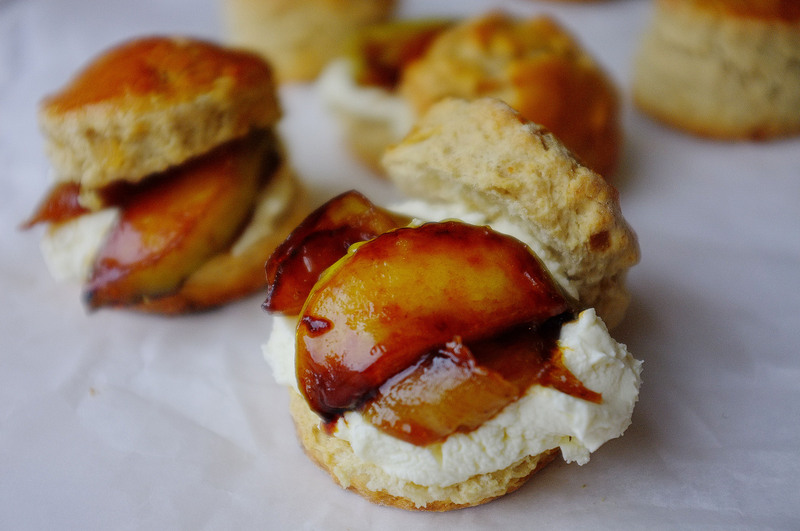 While the scones are baking, caramelise the apples. To do this just slice them up into wedges, then put the butter and sugar in a deep frying pan. Allow the butter to melt over a moderate heat then swirl the pan. Once the butter and sugar starts caramelising lie the apple slices in the pan and cook for a couple of minutes on both sides until golden and sticky but with a little bite remaining. Set aside. Whisk the mascarpone, cream, ginger syrup, icing sugar and Calvados together in a bowl until just combined. Don’t over-whip. 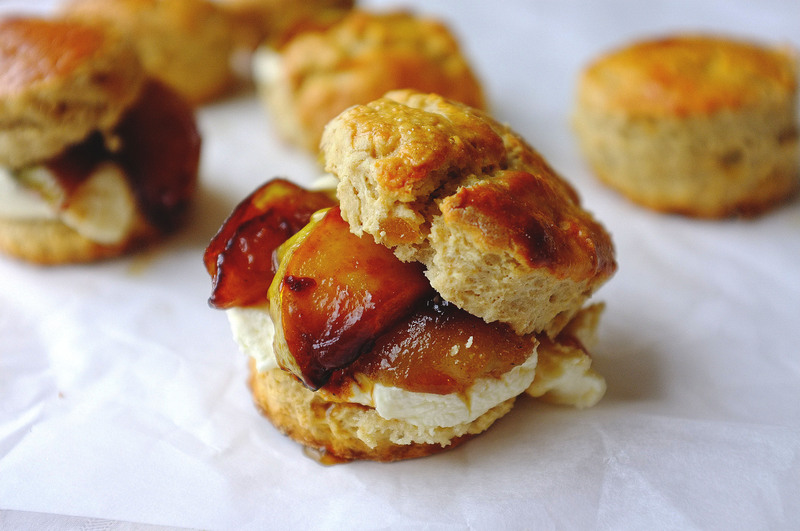 To serve, slice the scones in half and top with a generous helping of mascarpone, a few slices of caramelised apple and any leftover pan juices. It might be winter, but there’s no reason why ice cream should be an indulgence reserved for the warmer months (especially when it tastes this good). 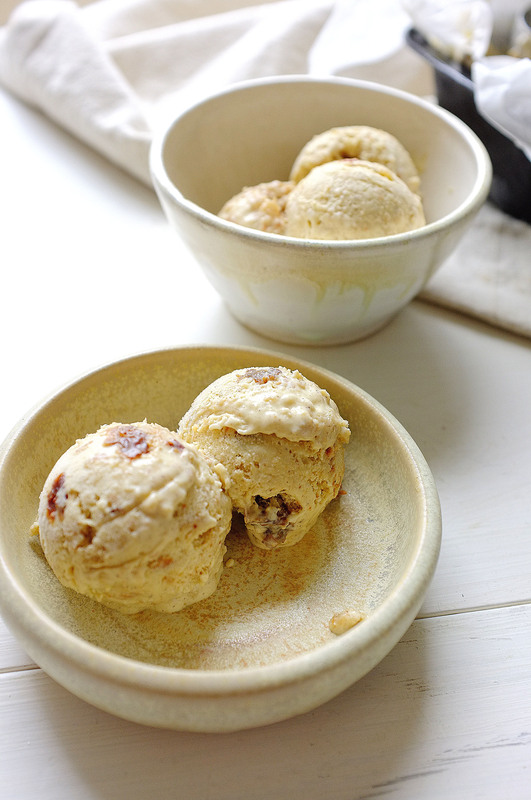 This variety consists of a smooth and nutty peanut butter custard base and a generous helping of crunchy caramelised white chocolate, which is rippled through and sprinkled on the custard after churning. Side note, caramelising white chocolate in the oven is a game changer- it takes on a beautiful golden colour and intense butterscotch flavour; once cooled it can be broken into a crumble and used on just about anything! Preheat the oven to 140c. 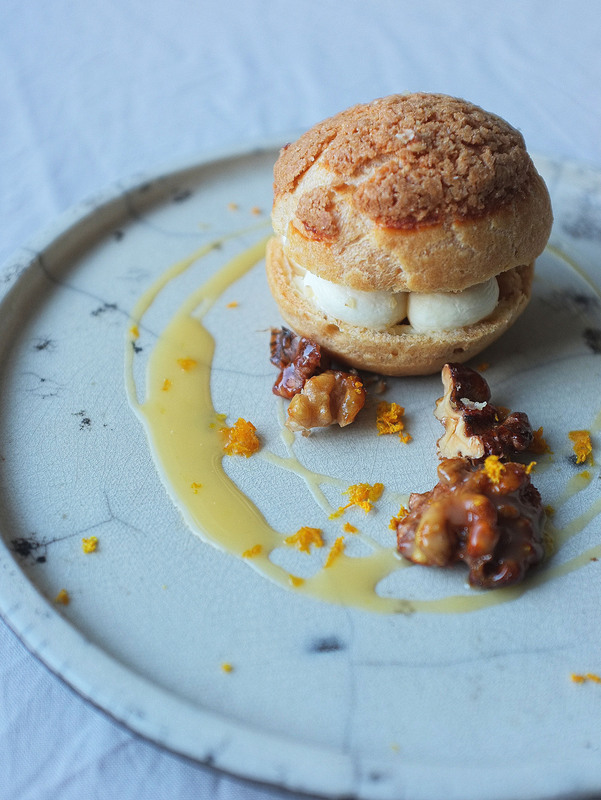 Before you make the peanut butter custard, caramelise the white chocolate. 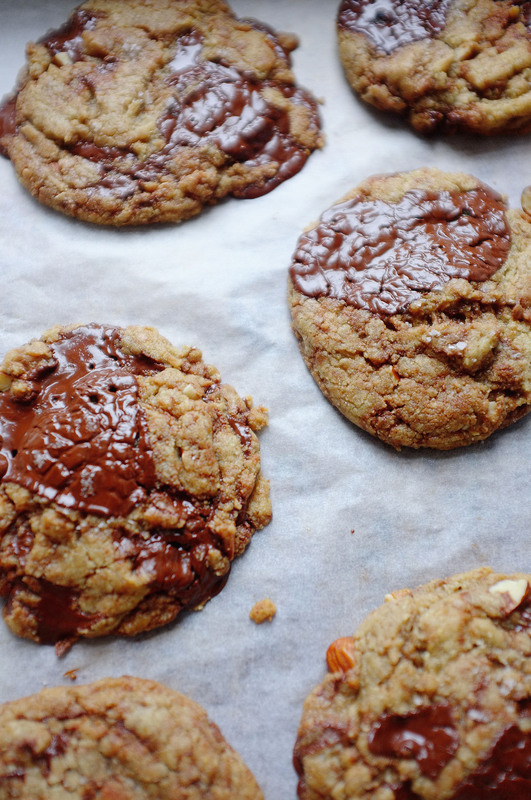 To do this break the chocolate into rough chunks and lay out on a baking tray lined with greaseproof paper. Pop the tray in the oven for about half an hour, or until the chocolate is golden brown (it will look a little almost burnt, but don’t worry!). Set aside to cool while you make the custard. Pour the double cream and full fat milk into a large saucepan, bring to a boil then set aside. Whisk the sugar and egg yolk together in a large bowl until pale and thick, then gradually add the hot cream mixture followed by the peanut butter and salt then whisk again to combine. Return the mixture to a clean pan and set over a medium heat. Stir constantly until it thickens and reaches a custard consistency (or coats the back of a spoon- be careful not to overheat or the mixture will end up looking like scrambled eggs). Once the mixture has thickened, strain through a sieve and chill for an hour, then pour into an ice cream maker and churn for at least half an hour (or until very thick and creamy). 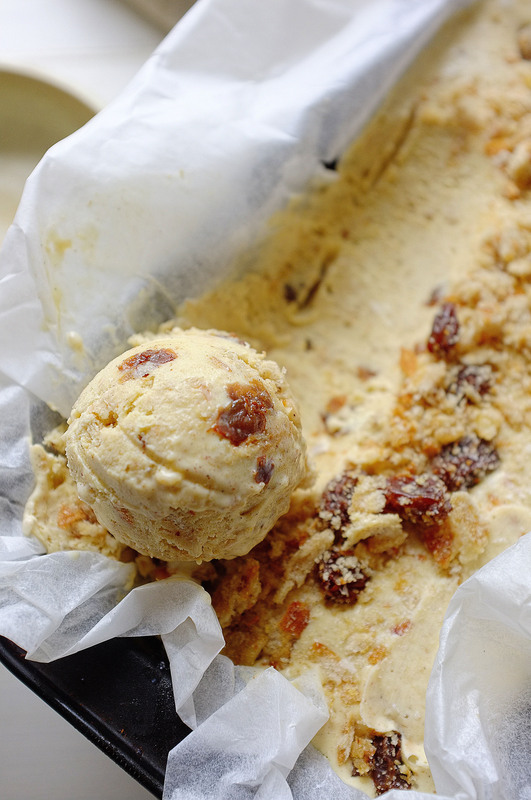 While the ice cream is churning, break up the caramelised white chocolate into a coarse crumble then line a 1.5litre tub or loaf tin with greaseproof paper. 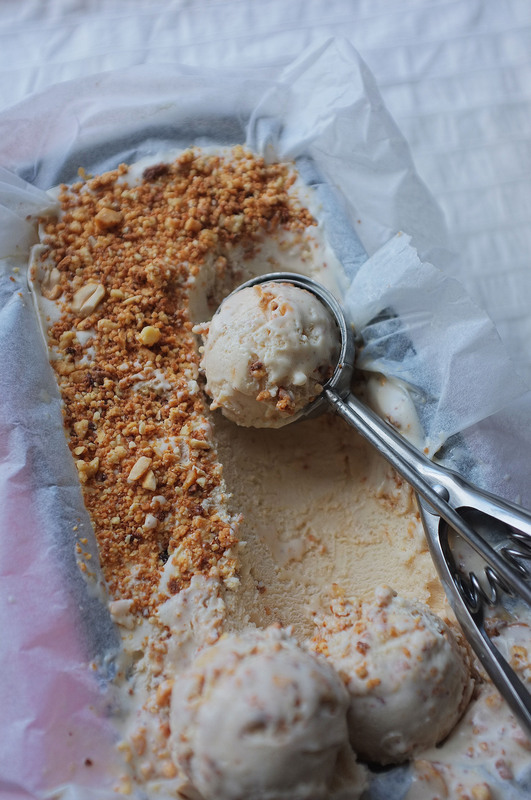 When the ice cream is ready, scrape it into a bowl along with 2/3 of the white chocolate crumble. Ripple the chocolate through the ice cream with a large metal spoon, then tip it into the lined tub/tin and level out. Sprinkle the remaining white chocolate crumble on top and finish with the chopped peanuts. Cover and freeze until firm. 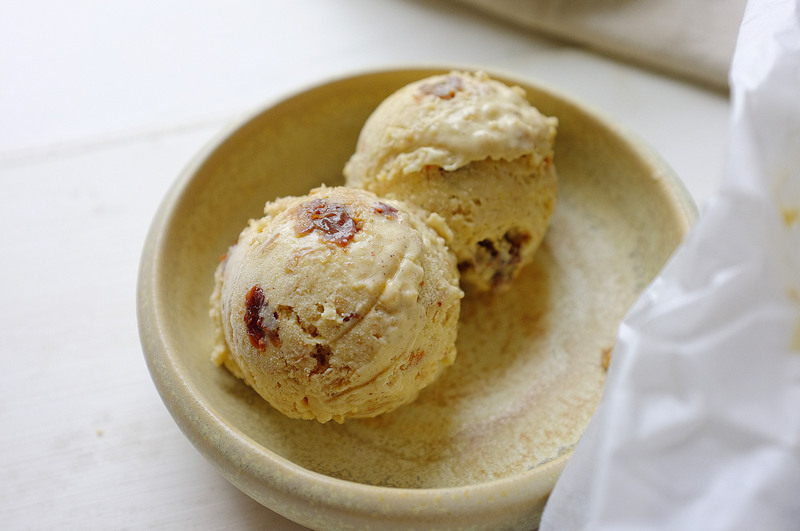 Remove the ice cream from the freezer 10 minutes before you’d like to serve it, to make scooping easier. 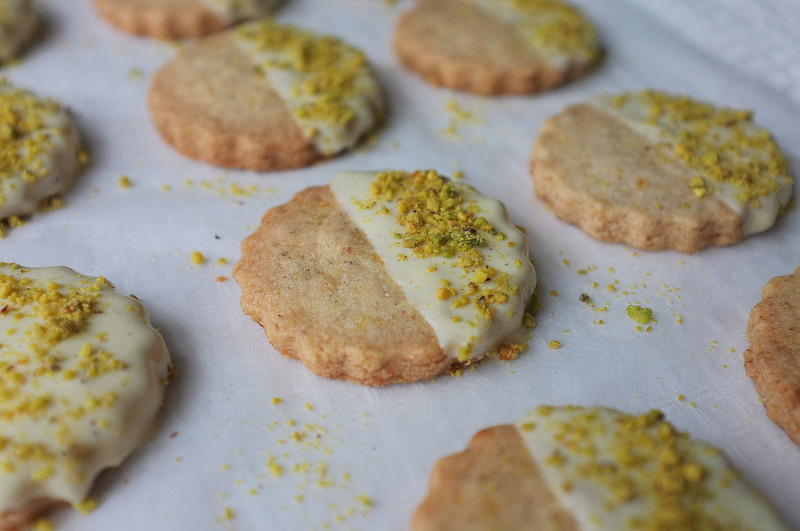 These buttery shortbreads, dipped in white chocolate and flavoured with warming cardamom and citrus, have got me feeling (dare I say it) pretty festive. The format might be a bit retro but there’s something comforting and nostalgic about bedding in with a batch of homemade biscuits and a cup of builder’s tea at this time of year. 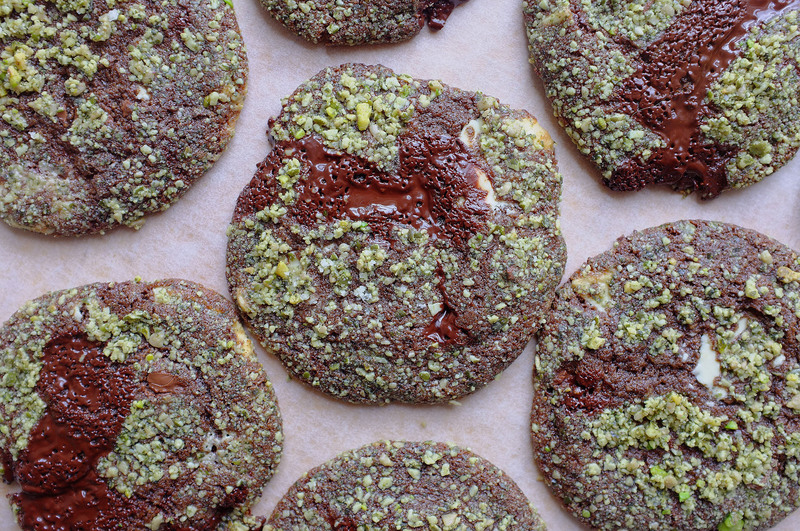 Give them a try for a quick and easy twist on a classic. Place the butter, sugar and orange zest in a large bowl (or bowl of a stand mixer with paddle attachment) and beat until very light and fluffy. Add in the flours, salt and ground cardamom and beat briefly until the flour is just incorporated and the mix starts to come together in large clumps (it’s important not to over-mix here as beating for too long could result in a tough biscuit which isn’t buttery and short!). Bring the mix together with your hands and roll out on a floured surface to about 1cm thick. Stamp out biscuits using a cookie cutter (or just slice the dough into squares with a knife) and line up on a lined baking tray. Chill for at least 30 minutes, or until firm. Preheat the oven to 180c. 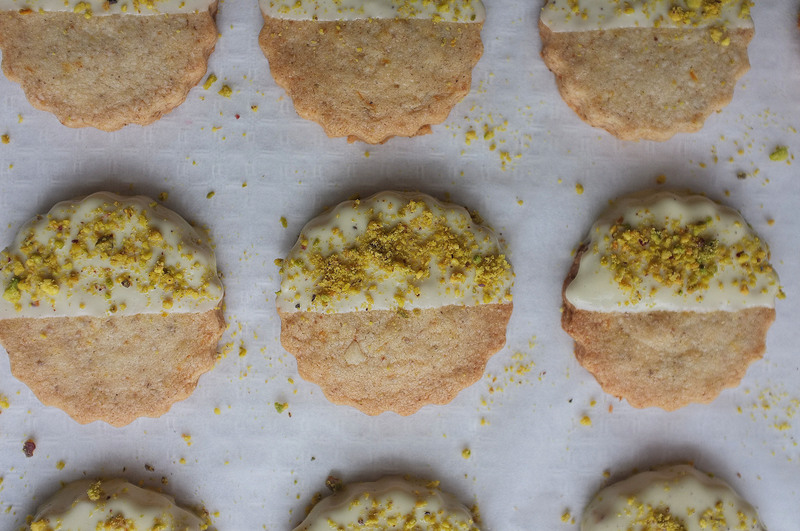 Once your biscuits have firmed up, bake for 12-15 minutes or until the edges are golden. Leave to cool on a wire rack. Melt the white chocolate in a heatproof bowl set over a saucepan of simmering water (or melt in the microwave at 30 second increments, stirring between each) then dip each biscuit in, about half way up. 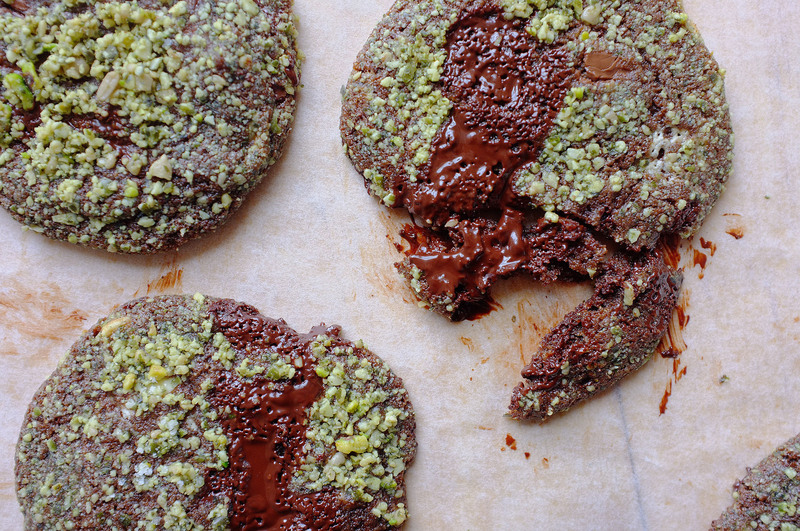 Place the dipped biscuits on a piece of greaseproof paper for the chocolate to set and sprinkle with pistachios. 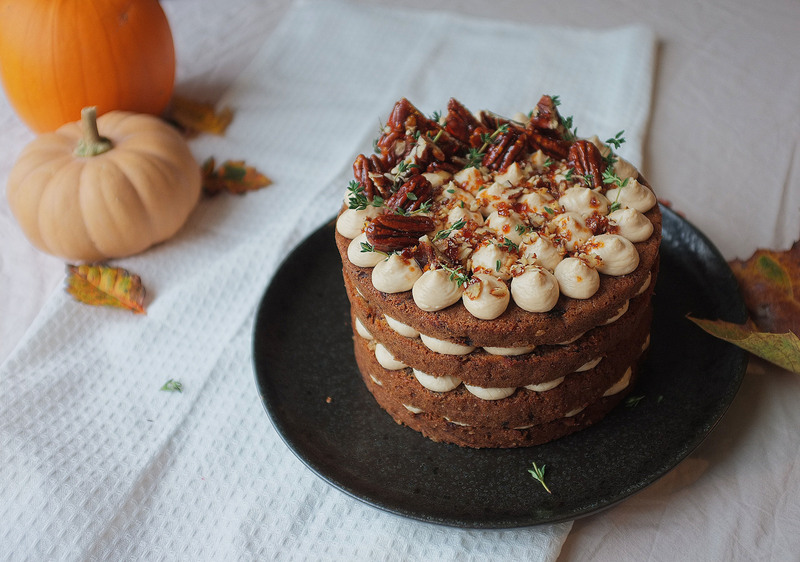 Make the most of squash season with an ode to the Autumn months; made up of heavily spiced pumpkin and brown butter layers, smooth bourbon-laced caramel cream cheese icing and a slightly salty crunch of pecan brittle, this cake is absolutely delicious and marries together some of my favourite flavours. Start off by making the caramel. To do this place the water and sugar in a saucepan set over a gentle heat; do not stir, but swirl the pan occasionally to encourage the sugar to dissolve. Once the sugar has dissolved and you have a clear syrup, increase the heat and boil until it turns golden brown. At this stage add the double cream and stir, then pour in the bourbon and stir again. Continue to stir on the heat for another couple of minutes, then set aside and add the salt to taste. Leave to cool completely. Preheat the oven to 170c. Grease and line two 8 inch cake tins with baking paper. Place the butter in a saucepan and leave to melt and bubble until it starts to brown and smell nutty. Set aside to cool. Once the butter has cooled put it in a large bowl (or bowl of a stand mixer with paddle attachment) along with the sugars and egg and mix until pale and thick (about 5 minutes). Beat in the flour, bicarbonate of soda, salt, baking powder and spices and stir until just combined. Stir through the pumpkin, sultanas, lemon zest and pecans. Split the batter between the cake tins and bake for 30-40 minutes or until a skewer comes out clean when inserted. Leave the cakes to cool completely in the tins. 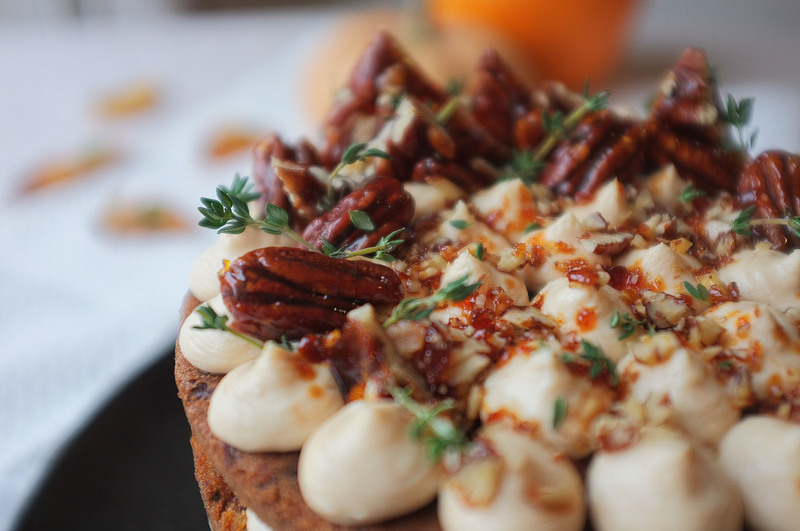 Meanwhile, make the icing by simply whisking together the mascarpone, cream cheese and caramel until smooth. Pile into a piping bag fitted with a round nozzle. 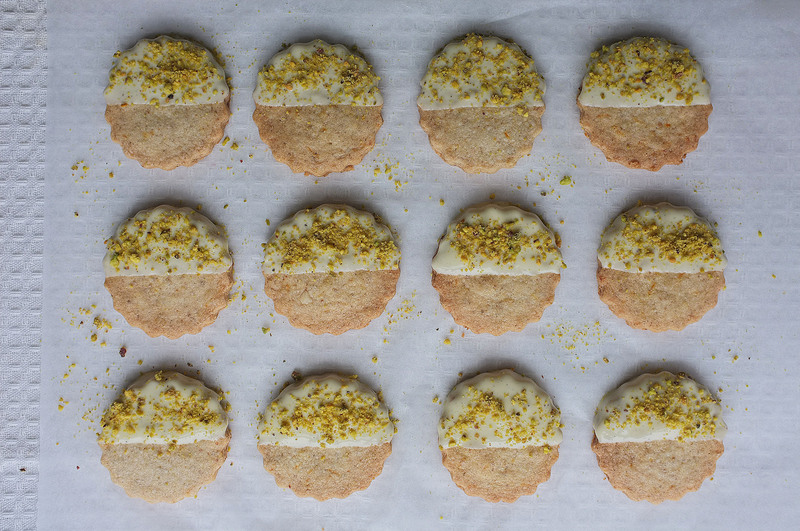 Once the cakes are completely cool, remove from the tins and slice in half horizontally (leaving you with 4 layers). Pipe the icing in little mounds over the whole surface area of the first layer, then stack up the remaining layers, repeating the piping as you go. 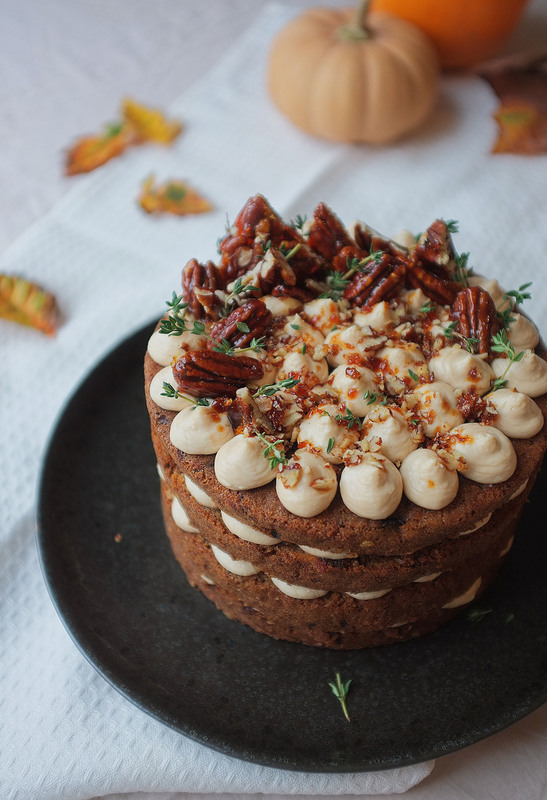 Decorate the top with pecan praline and thyme. A couple of months ago I bought, then promptly forgot about, some delicious pine honey which I intended to use as the central flavour in a pastry-based recipe. Now that it’s been retrieved from the depths of my cupboard it has well and truly fulfilled that destiny in these crisp craquelin choux buns. 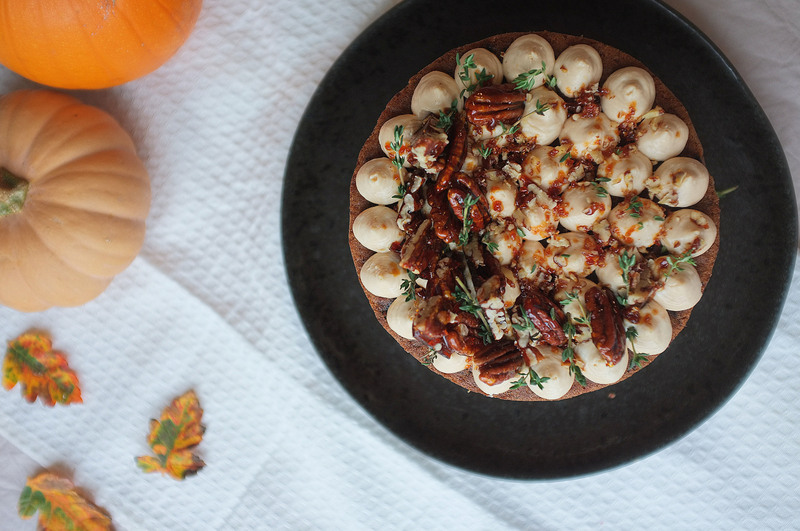 Simply filled with honeyed orange mascarpone and walnuts (also baked in the honey and a little salt) these make for a delicious treat, but served alongside honey butterscotch sauce and they’re next level- perfect for a fancy Autumnal dessert. 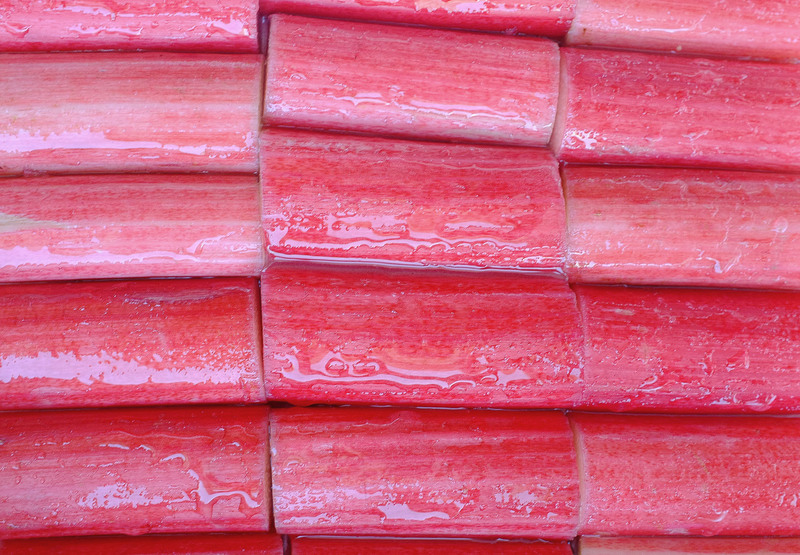 Start off by making the craquelin topping (when baked, this forms a crispy sweet layer). To do this simply mix the butter, sugar and flour in a large bowl (or in the bowl of a stand mixer with paddle attachment on a slow speed) until it starts to form large lumps, then bring it together with your hands. Place the dough on a large piece of baking paper, top with another piece of baking paper, and roll out to about 3mm thick. 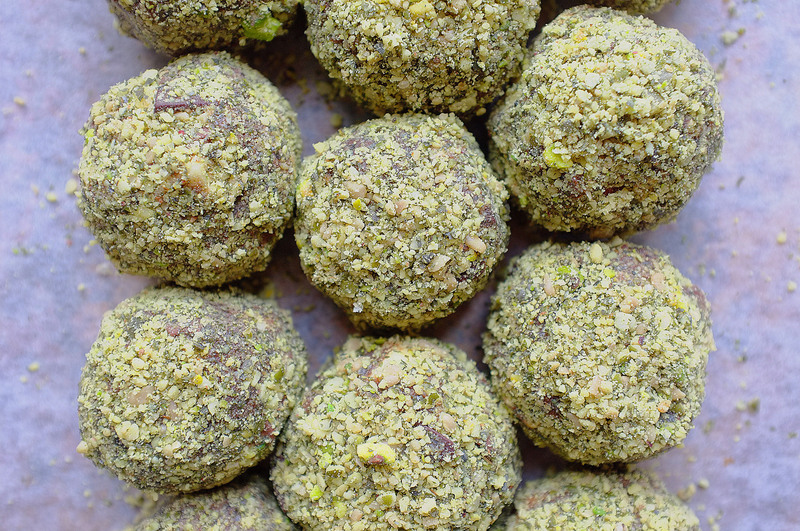 Pop this onto a tray and leave in the freezer to solidify. To make the choux, put the water, butter and salt in a saucepan set over a medium heat (do not let it boil at this stage). Meanwhile, sieve the flour to remove any lumps. When the butter has melted into the water, increase the heat and bring to a rolling boil, then tip in the flour and stir vigorously until you have a smooth paste-like mix which comes away from the edges of the pan. Continue to stir for another minute to cook out the rawness of the flour, then tip into a clean bowl and close cover with cling film (this eggless stage is known as a ‘panade’). Leave to cool to room temperature. Pipe rounds of about 4cm wide onto the prepared baking trays, leaving plenty of room for expansion. Whisk the remaining egg in a bowl and brush a small amount onto each mound, smoothing down the tip. Take your craquelin sheet and stamp out 3cm circles. Place one on top of each choux mound (the egg will help secure it in place). 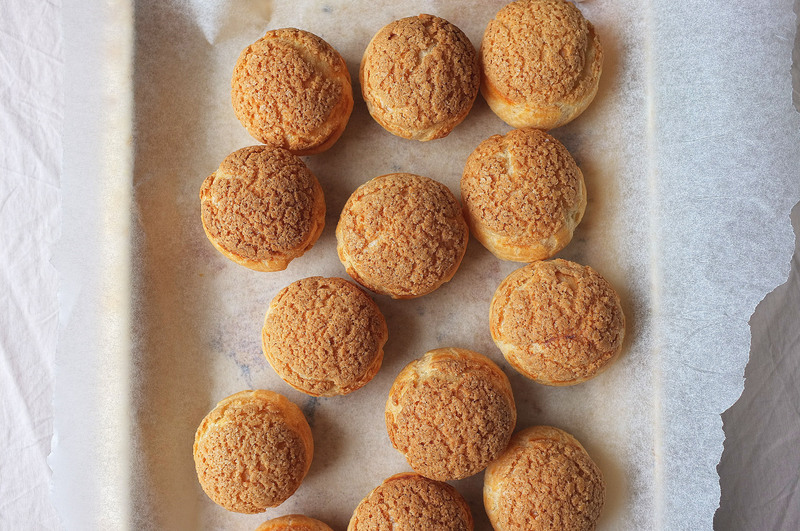 Bake the choux for around 35 minutes, then skewer a small hole in each bun and return to the oven for a further 5 minutes, to dry out the middles. Once baked, they should be crisp and golden brown with a crackled appearance on top. Cool while you make the other elements. Toss the walnuts in the honey and salt and spread out on a baking tray. Cook for around 10 minutes or until caramelised then set aside to cool. Once cooled, roughly chop. For the filling, just whisk together the mascarpone, cream, honey and orange zest until light and smooth. Pile into a piping bag. Finally, for the sauce heat the honey and orange juice in a saucepan and simmer for a couple of minutes, add in the butter and stir until it’s melted, then add the cream and salt. Keep gently simmering, stirring occasionally, until slightly thicker (a few minutes should be fine), then set aside. 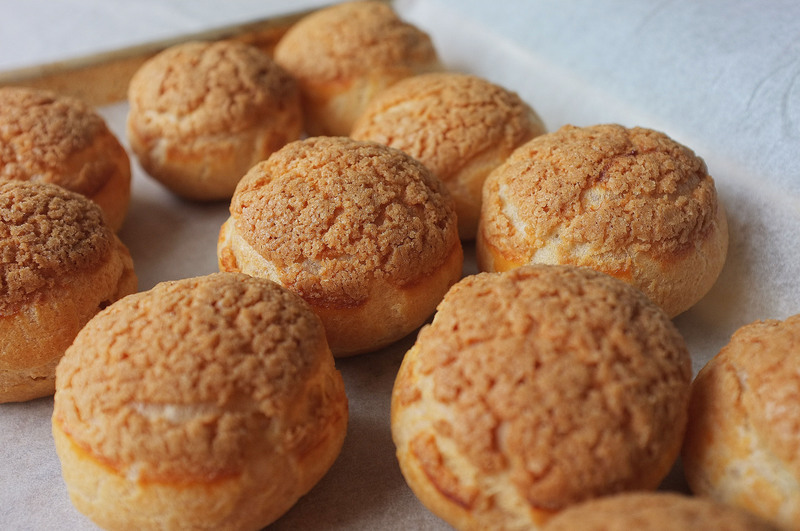 To assemble the choux buns, slice each one in half and pipe some mascarpone cream into the base. Top with a sprinkling of walnuts and a little sauce, then place the lid on. Serve with some extra sauce. 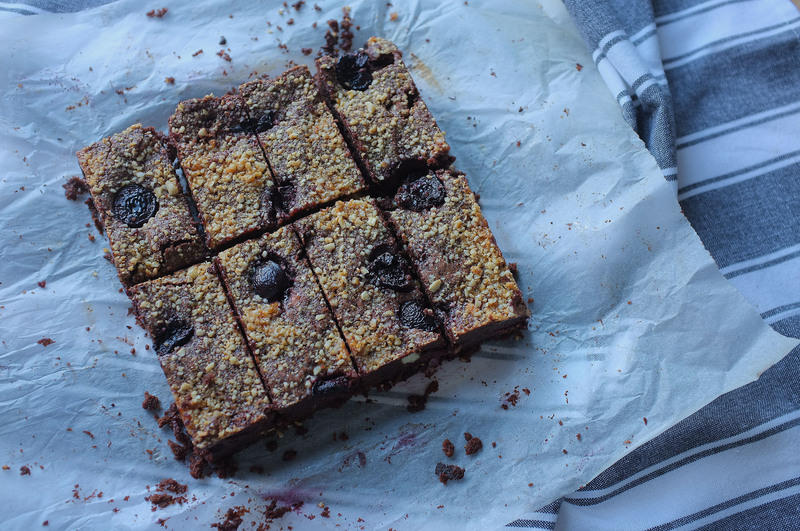 It will come as no surprise to find out that I’m partial to a chocolate brownie, and having tried a fair few, I can safely say this variety (which I threw together as an experiment and didn’t have particularly high expectations for) is now a firm favourite. 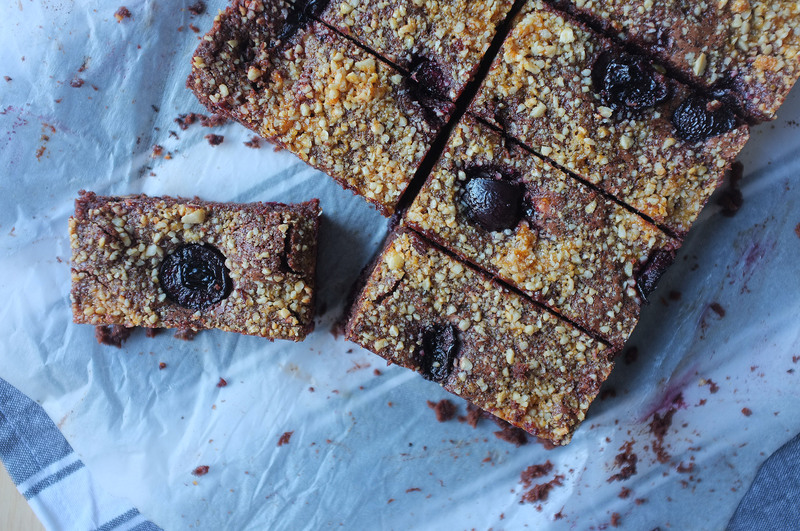 With a blackberry and cherry compote core and hazelnut praline top, these moist and deeply chocolatey bars deliver the dense, moist texture you expect from a great brownie, but also carry a welcome tang and contrasting crunch which make them a little different and perfect for late summer. 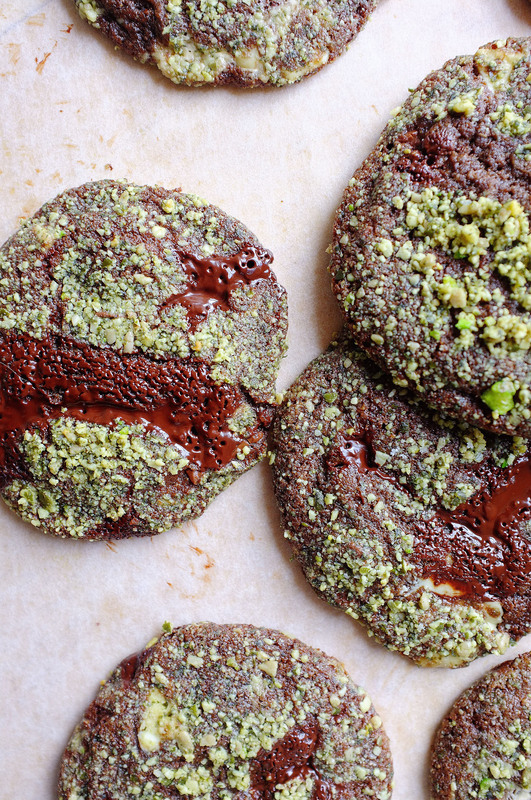 Before you make the brownie batter, prepare the fillings. Start with the hazelnut praline; to make this simply place the sugar in a heavy bottomed pan and heat gently until it forms a caramel (don’t stir, just swirl the pan to move the sugar around). 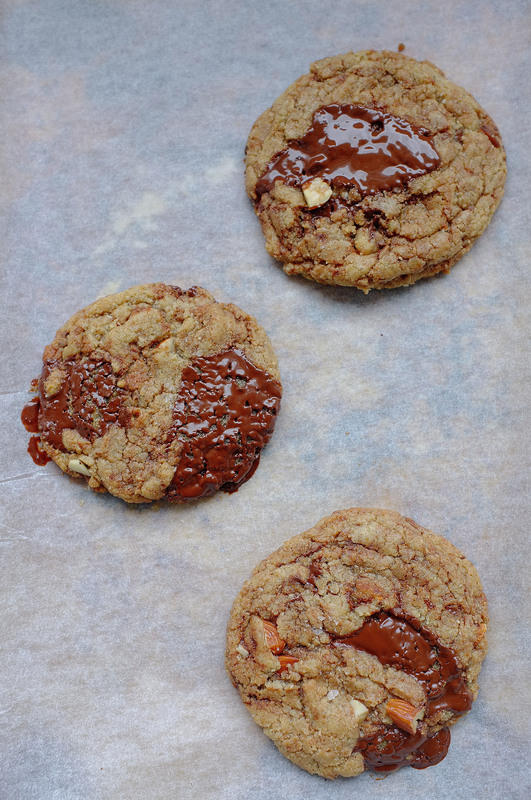 Once the caramel has taken on a golden colour, add the hazelnuts and stir to coat. 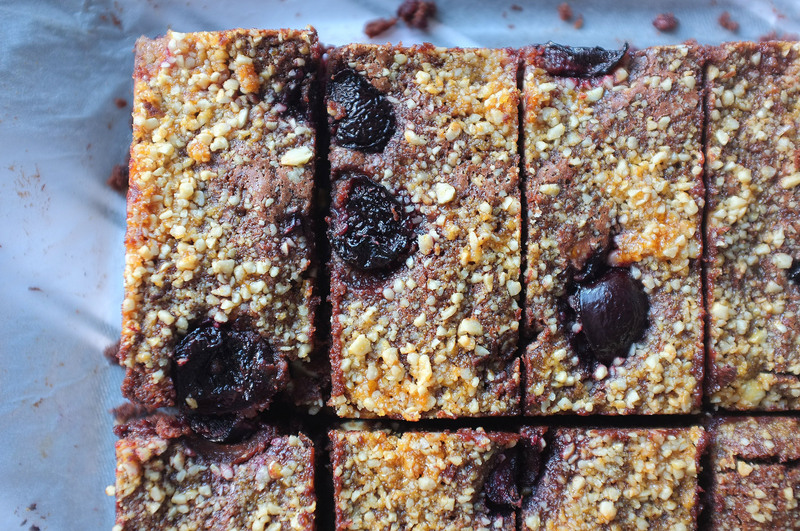 Scrape the contents of the pan onto a baking paper lined tray and spread out in an even layer. Leave to harden. To make the black forest filling, place 300g of the fruit in a saucepan along with the caster sugar, lemon zest, lemon juice and kirsch (if using). Heat gently until the berries release their juices, then increase the heat to medium and, stirring occasionally, reduce to a compote consistency. Set aside to cool. The caramel will now have hardened around the hazelnuts. 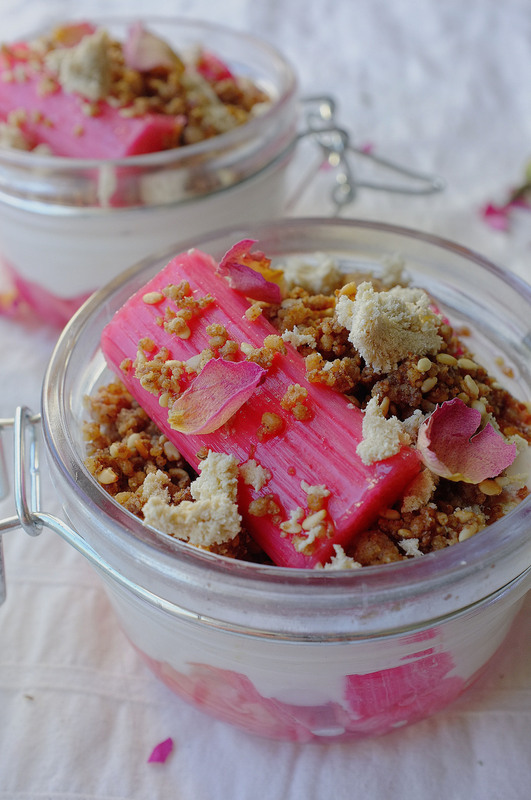 Break it up into pieces and place in a food processor, then blitz until you’ve got a coarse crumble (don’t over blitz, you want a little texture to remain). Now it’s time to make the brownie batter. Preheat the oven to 170c and grease and line a 20x20cm brownie tin. Put the chocolate and butter in a heatproof bowl and melt together over a pan of simmering water. Set aside to cool a little. While the chocolate mixture cools, place the sugars, salt, eggs and egg yolk in a stand mixer (or in a large bowl) and beat until very light and voluminous (it will pretty much double in size). 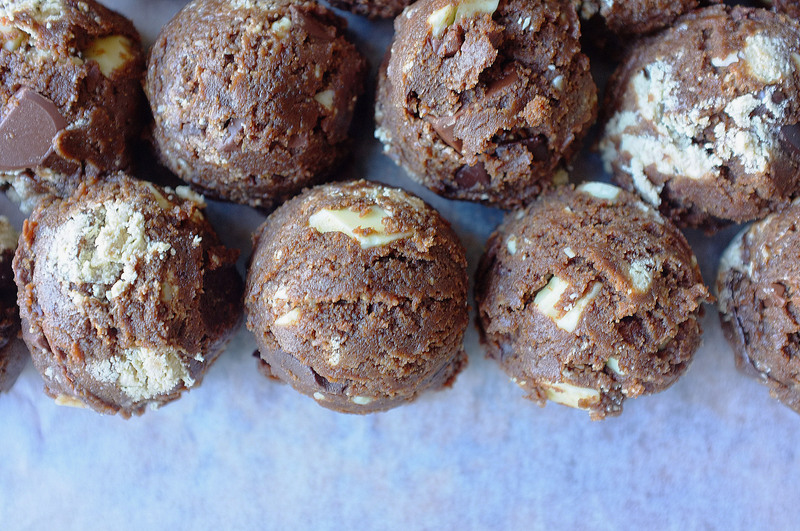 Once the egg mixture is ready, pour the chocolate mix down the side of the bowl and fold in using a large metal spoon, then add the flour and do the same until you have a smooth, lump free batter. Now add the chocolate chunks and stir through to evenly distribute. Tip half the mix into the brownie tin and level off. Scrape in the black forest filling and sprinkle over most of the hazelnut praline. Top with the rest of the brownie batter then, finally, scatter on the remaining fruits and praline. When it’s ready, the brownie will have a crisp top but will wobble slightly when shaken and have a gooey texture inside. Set aside to cool (completely) in the tin then once it’s set up a little, remove, slice up and serve.